Ra One is a sci-fi movie . 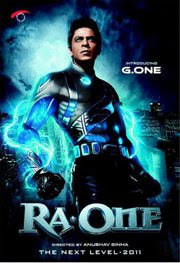 Ra.One is currently India's most expensive film to date and is expected to release in both 2D and 3D formats worldwide, along with its dubbed versions in Tamil, Telugu and German. Most interesting thing in this movie that singer Akon sang few songs in this movie in hindi. The film revolves around SRK who is a software engineer Jeevan. He designs a video game named 'Random Access – Version One’ whose acronym is Ra. One. Shahrukh gives his character name G. one, who is a superhero and his main aim is to kill villain Ra. One.